The painting entitled "Le principe du plaisir" topped the price fetched by "La corde sensible", which was sold in February 2017 in London for $17.9 million. 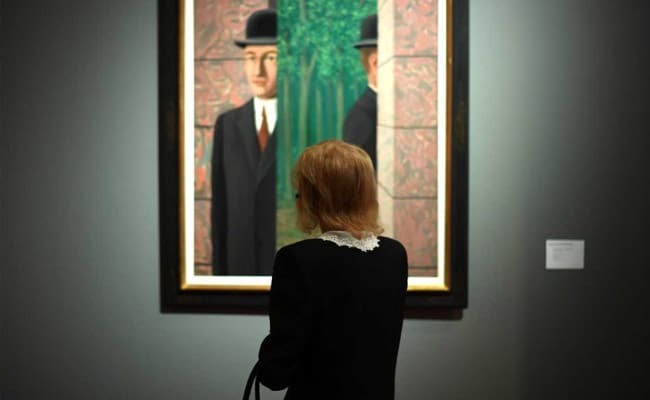 A painting by Rene Magritte sold for $26.8 million Monday at a Sotheby's auction in New York, setting a record for a work by the Belgian surrealist. Sotheby's had estimated the painting sold Monday as being worth 15 to 20 million dollars. It said seven collectors -- an unusually high number -- bid for it. Other paintings on offer on the second night of the autumn art auctions in New York also surpassed their estimated value. "Improvisation on Mahogany" by Russian-born Wassily Kandinsky, fetched $24.2 million, compared to its pre-sale estimate of 15-20 million dollars. A painting that was supposed to be one of the main attractions of the auction failed to lure a buyer. It was Marsden Hartley's "Pre-War Pageant", considered to be one of the first totally abstract works in the history of American art. It was estimated at $30 million, nearly five times the record for that US painter. On Sunday, the Vincent Van Gogh Painting "Coin de jardin avec papillons", estimated at $40 million, went begging at a Christie's auction of Impressionist and Modern art. The fall art auctions continue through Thursday evening.